Contrary to popular belief, there are very few ‘a-ha’ moments in VC. Startups are on a 10-year lifecycle and despite all the stimulation and exposure, there’s a modicum of tangible wins (or clear cut failures) to learn from. Last week I had one of these ‘a-ha’ moments catching up with our Work-Bench portfolio company vArmour that speaks to the eye-widening impact of distributed security systems. We were discussing the company’s new cyber deception product launch. In summary, the team is bringing a step-function improvement to honeypots, making what was for years an esoteric security practice due to complexity and performance requirements a reality for the masses. Earlier this fall I published an article predicting that a new class of AI-powered applications will reshape the workplace by automating away the individual tasks that make up our jobs. Most of the companies featured in the landscape are early stage startups. 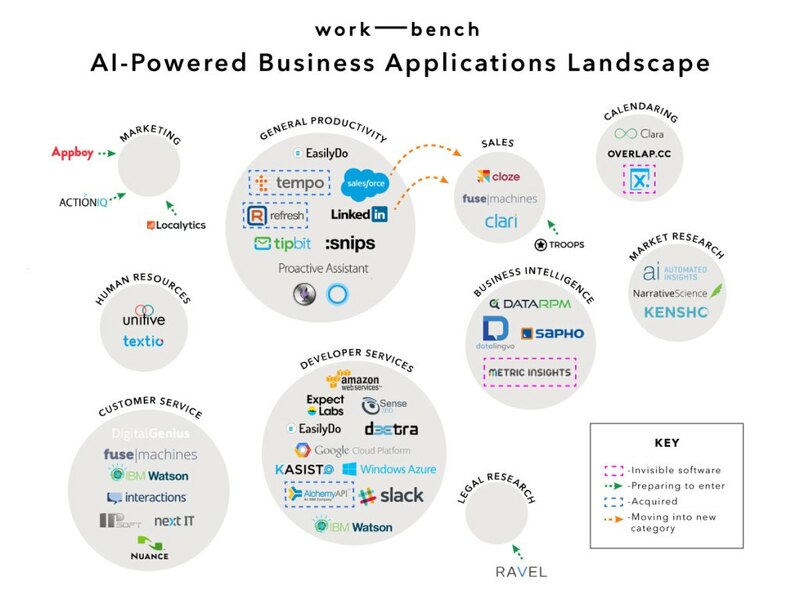 I recently had an interesting conversation with someone who argued against the viability of artificial intelligence startups, given the tremendous budgets and development resources large tech companies like IBM are committing to develop broader platforms — the premise being that these platforms will fill each niche application startups try to carve out (think scheduling meetings or answering common customer services requests).